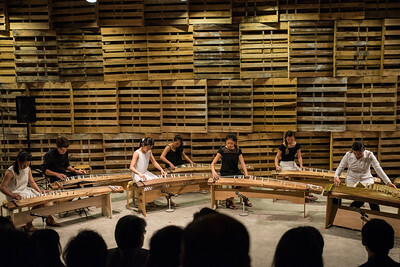 Last month, we had the 2015 NYC Tour benefit Concert at the Bankart Studio NYK. The 9th graders played a piece called “Warabe Uta” by Yuize Shinichi. We practiced this piece for 2 months during class, at home, and before school. I think I practiced more frequently and was ready for the concert than last year since I was able to memorize the piece earlier before the concert and spend more time focusing on the details such as dynamics. When we practiced in class, we especially focused on the dynamics and tempo. One of my challenges was keeping in mind about the dynamics because sometimes I forgot about it and played the strings too strong or too weak. Another challenge was playing in a good tempo because I sometimes rushed and played in a faster tempo than others. It was hard to synchronize with my peers as well because some people including myself rushed sometimes, or played strongly when it was supposed to be soft. Listening to others helped me overcome this challenge. I think the concert went well since we hardly made any mistakes and listened to each other. This helped us play in a good tempo in the correct dynamics. Although some of us were nervous, we all had a lot of fun during the rehearsal and the concert.